Sony drops details on some new characters and crossplay with the PS Vita in the Smash Bros. lookalike. 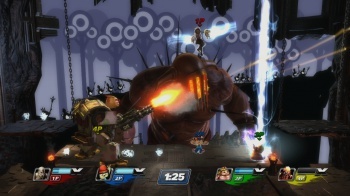 There's a lot of characters jam-packed into PlayStation All Stars. Jack Tretton, the CEO of Sony Worldwide, mentioned the awesome ad in which many of platforms most memorable characters gave tribute to Micheal, the player who controlled them. After that toast, Tretton said the characters all decided to duke it out in a 2D fighter platformer. We got to see the game in action at Sony's Press Conference tonight in L.A. at E3 2012, with two players using a PS3, and two using a Vita, all playing together. In addition to known characters like Sly Cooper, Sweet Tooth (Twisted Metal) and Fat Princess, there will be a little scoundrel named Nathan Drake from Uncharted as a playable character in PlayStation All Stars: Battle Royale. Then the lights went dark in the coliseum, and the crowd of eager gamers were treated to a fancy video reveal. A girl's voice giggled, and the unmistakable helmet appeared on the screen. That's right, the Big Daddy from BioShock will get into the ring along with Solid Snake, Kratos, and the rest of the PlayStation All Stars. The crossplay between the Vita and PS3 is a brilliant move and gameplay seemed to work seamlessly between the handheld and the beefier console. Hopefully, PlayStation All Stars will help Sony sell some Vitas. At least, that's what Jack Tretton is betting on.